Huey, Dewey, and Louie Originally there was no way to tell Donald’s nephews apart, because the colors on their costumes were used interchangeably. 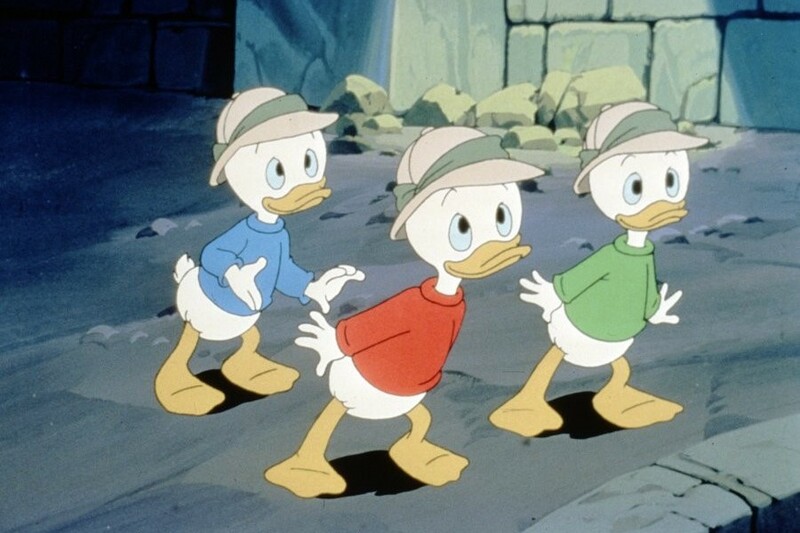 Because the stories for the Ducktales television series were more complicated than they were for the short Donald Duck cartoons, it was deemed necessary to distinguish between the three nephews. So, Huey was dressed in red, Dewey in blue, and Louie in green. You can remember this by noting that the brightest hue of the three is red (Huey), the color of water, dew, is blue (Dewey), and that leaves Louie, and leaves are green. The nephews made their debut in the Donald Duck Sunday comic page on October 17, 1937, and first appeared on film in Donald’s Nephews.